Donor Israel Yanoff and Holocaust Council director Barbara Wind admire the bust of a young unknown Holocaust victim. The sculpture and 39 other Shoa-related works of art are on display at the Aidekman campus in Whippany until Nov. 18. 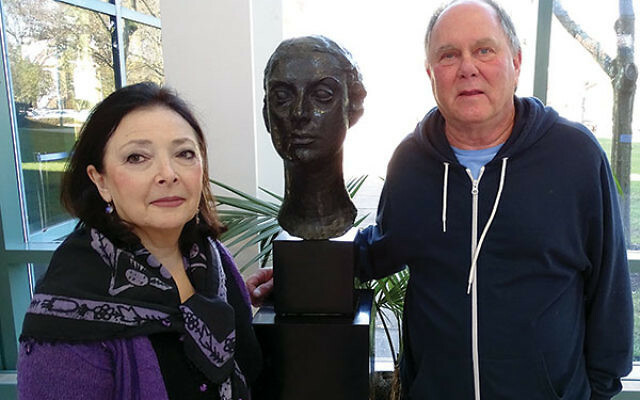 The bust of a young Jewish woman who is believed to have been murdered during the Shoa has taken its place alongside some 39 other pieces of art now on display in the atrium of the Aidekman Jewish Community Campus in Whippany. The sculpture is the work of artist Jacob Luchansky. It was donated on Nov. 1 to the Holocaust Council of Greater MetroWest by Israel Yanoff, a South Orange man who inherited it from his parents. Luchansky, who was born in 1876 in Poland, later moved to Israel, where he was awarded the Dizengoff Prize in sculpture and painting. He died in 1978. Yanoff’s parents — Louise and Leo Yanoff — were art collectors who were dedicated to the Jewish community. From 1958 to 1960, Leo, who died in 2010 at the age of 99, was a past president of the Jewish Community Council of Essex County, a predecessor of the GMW federation. Louise was a pianist who was also interested in the arts. “My parents really loved the bust,” Yanoff said. “Many people sell things, but it is better to give this away to a worthy organization, and I think my parents would be pleased” to have it go to the council, a department of the Jewish Federation of Greater MetroWest NJ. “We are thrilled to add this to our collection,” said Wind. Once the exhibit runs its course on Friday, Nov. 18, the bust will be stored nearby in the campus’s Wilf Holocaust Memorial and will be part of the council’s annual “From Memory to History” exhibit in January.